Lotto: the numbers drawn were 26,16,20,11. The next draw is on 12/12/12014, the jackpot is €10,800. The national Club draw throws in this week . It’s a fantastic way to raise funds for the club and its teams. The tickets are ideal stocking fillers and are available in the club shop and from committee members. Get your workmates, friends and family in on the act. For €10 you have the chance of winning some fantastic prizes. . Please support this fantastic initiative by, pardon the pun, buying or selling tickets. · 2 Corporate Box concert tickets with pre-concert hospitality in Croke Park in 2014. And many more. This year there will be even more. The Competition will take place on Saturday 13th December, starting with the semi-finals at 2.45pm. The over 35s/Mentors game will take place at 4pm with the final of the cup starting at 5pm. The disco takes place on Sunday 21st. Tickets are selling fast! 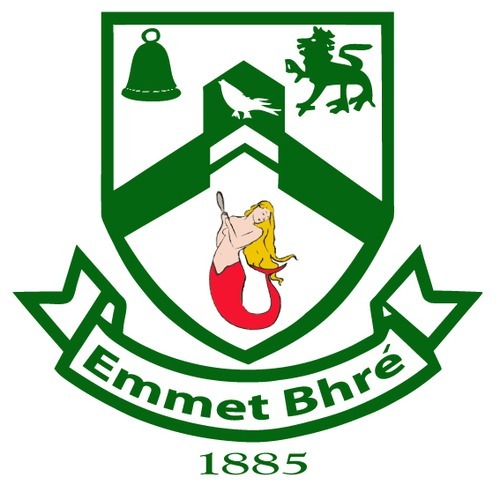 Bray Emmets under 20 squad took part in a one day championship on Sunday the 30th of November. This competition was due to have six teams in it but with two teams pulling out at the last minute we were left with four so it was played as straight knock out, two semis and a final. In our first match we faced County Minor Champions for the two previous years St. Pats. This game had a real feel of championship about it with some hard hits from both sides going in and some fine scores. Marc Lennon got a nice goal and a point in the first half with Daire Henderson and Cathal Magee adding another couple. In the second half Diarmuid Masterson scored a fine solo effort goal running from just inside the 45 metre line and blasting to the roof of the net. Lee Brandon also scored from a 45. Bray won on a score line of 2-4 to 1-3. The final was against old rivals Blessington who had beaten Dunlavin in the semi-final. This game was close affair with hard fair tackling being a highlight of the game. The Emmet‘s full back line of Cathal O’Dualeachain, Shane Lohan and Peter Conroy were to the fore in the first half not giving the dangerous Blessington full forward line an inch. Bray were four points to nil up at half time with two points coming from Diarmuid Masterson, (one a 45) and points from Mark Lennon, and a free from Cathal Magee. Although Bray continued their hard work in the second half they were not registering anything on the score board. In that second half Blessington got the goal that they were looking for and in the last five minutes they had a very late rally to win the game 1-3 to 4 points. Other Bray players to shine on the day were Daire Lohan, Donnchadh O Mideach and the two midfielders Dylan Terry and Eoin McCormaic. The management team of Paddy Moynihan, Brian O’Keeffe, Paul Barry and Tony Denver would like to thank all 19 players that showed up on the day as we had a number of late drop outs. The players did their parents, club and themselves proud. The general play and attitude of the whole panel bodes well for our adult teams in the coming years. Panel: Karl Murphy, Peter Conroy, Shane Lohan, Cathal O’Dualeachain, Donnchadh O Midheadh, Daire Lohan, Ben MacCormaic, Dylan Terry, Eoin MacCormaic, Matt Thompson, Diarmuid Masterson, Gavin Dowling, Daire Henderson, Cathal MaGee, Marc Lennon, Lee Brandon, Andrew Sutton, Dan Cody, Liam Morgan. Despite the rain, a very enjoyable night was had by all involved with the inviting refreshments proving to be just the tonic. The parents were very appreciative of the organisers, and the generosity of their work on the night. ,B’fhéidir go bhfuil sé in am dúinne a leithéid de chomórtas a eagrú in Emmet Bhré. On Sunday, 23rd November, Bray Comhaltas organised a very successful Music session for their young members upstairs in the Bray Emmets clubhouse. There were over 50 people in attendance, 30 young musicians along with another 20 family members in support. The music was led by Rachel Cullen and Sadhbh Byrne between 3.00 and 5pm.